When it comes to finding a used Chevy Silverado in the Colorado Springs area of Colorado, The Faricy Boys have plenty of competitive options for your consideration. With their impressive inventory of third generation Silverados, The Faricy Boys can help you track down the truck that’s right for you at a price to match. First debuted in San Antonio in 2014, the third generation of Chevy’s award-winning pickup continues to be a solid choice for those consumers in need of a dependable work vehicle that still offers style and comfort. Considering its impressive array of industry accolades, it’s no wonder so many consumers are considering a used Chevy Silverado for their next used pickup purchase. Of the Silverado’s many distinctions, a few of the most recognizable and consumer-relevant include: J.D. Power’s “Most Dependable Large Heavy Duty Pickup, Two Years in a Row,” Kiplinger’s Best-in-Class Full-Size Truck in 2015, Vincentric’s Lowest Cost to Own in America 2015, complemented by its Best Value in America 2015, and most recently, Car and Driver Editor’s Chocie Award for Best Full-Size Pickup Truck 2016. Let’s take a look at the current third generation’s 2014 entry and see why the Silverado has and continues to corner the competition, earning these accolades from the industry, not to mention – and perhaps more importantly – the loyalty and respect from both first-time and ever-faithful Chevy customers. It’s hard to get around the negative connotations of the word “used,” however, Chevy manages to do so with respect to their used trucks. Coupled with Chevy’s legacy of impressive trucks, The Faricy Boys careful inspection process ensures that your used Chevy Silverado purchase will be as “like new” as possible. Operated by a six-speed automatic transmission with manual shifting mode, the Silverado clocked in between 6.1-7.6 seconds on the zero to sixty mph dash, and 14.4-15.8 seconds on the quarter-mile, with a maximum speed measured at 110 mph. Fuel efficiency was estimated by the EPA between 16-18 city mpg and 22-25 highway mpg. 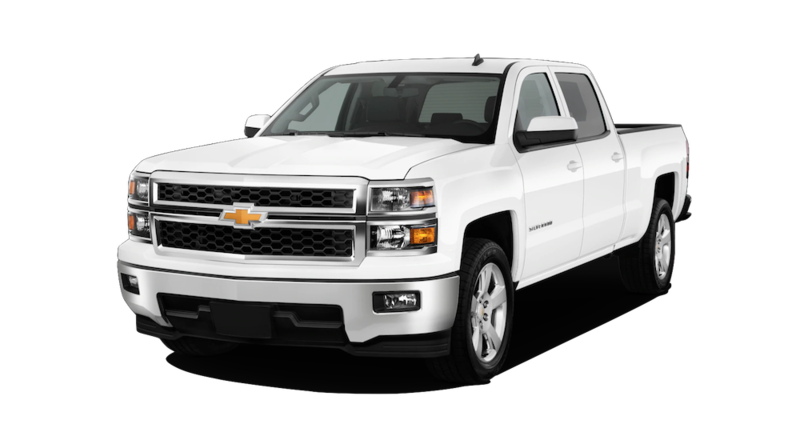 Available in a regular cab, double cab, or crew cab body style, the 2014 Silverado fits between 2-3 or 5-6 passengers, depending on which body style you choose, and comes with either two or four doors. With a towing capacity rated at 11,500 pounds, a used Silverado is able to tackle today’s challenges on the job site. Designers reinforced the Silverado’s frame with more high-strength steel, which ultimately created a smoother ride. Drivers even report a quieter ride on the road – some even comparing it to the hush of a Lexus – due, in part, to the inclusion of acoustic-laminated glass, lined front wheel wells, and triple-sealed doors. Peace and quiet – isn’t that what we’re all after, especially at the end of hard work day? The third generation of Silverados charged forward with optional comfort and convenience features, like a heated steering wheel and ventilated leather seats. In fact, the high-end High Country model further distinguishes itself with 20-inch wheels, top of the line tech, a unique grille, and a plush saddle-brown leather interior. Safety was further enhanced as well, thanks to the available technologies like a lane departure monitoring system, forward collision warning, and rear-cross traffic alert. Despite these upgrades throughout the 2014 Silverado model line, the base prices carried over, originally starting at $25,580 for the regular cab, $29,605 for the double cab, and $33,705 for the crew cab. We are currently still enjoying the third generation of the Chevy Silverado line, which is great news if you’re looking for a more recent model than the one introduced in 2014. The 2015 model year brought about some extra features and enhancements on the Silverados, including connectivity support in the form of OnStar 4G LTE with Wi-Fi capability, complemented by a larger antenna. The USB port moved to the glove compartment on models with a bench seat, and other new features included an available spray-on bed liner, as well as new off-road graphics on the Z71 trim. In addition, drivers could opt for the eight-speed automatic transmission setup. But, perhaps most exciting was the arrival of the Silverado Rally Edition appearance package, which recast some exterior details on the Silverado, including the grille frame, running boards, mirror plates, wheels, and Chevy’s signature bowtie logo – now all in black. For 2016, Chevy designers added more muscle for a more aggressive aesthetic overall. Additional improvements are afforded by extra enhancements to Apply CarPlay and Android Auto, as well as updates to Chevy MyLink technology. Basically, Chevy continues to build off its the success it has earned and long been celebrated for. Why mess with a winning formula? Especially when you consider that Chevy truck sales are already up by 33 percent this year. So, you’ve found the right automaker when it comes to your used truck purchase. While nothing beats a Chevy, no other dealership compares to the exceptional shopping experience you will enjoy when you visit The Faricy Boys. Family owned and operated for more than 73 years, the team at Faricy prides itself on fair, honest dealings, rather than quick or pushy sales. Transparent transactions are always goal, with customer satisfaction the team’s motivation. In fact, when it comes to sales, customers needn’t worry about hidden fees. The Faricy Boys competitively price their extensive used truck inventory and even provide their customers with a price protection guarantee on all purchases. In addition, all used vehicles are accompanied by a free CarFax history report and qualified used trucks even come with a comprehensive reconditioning report. For prospective consumers in the Colorado Springs area, you know how rugged the terrain is, and likely want a used vehicle that can conquer both roads and trails. Fortunately, The Faricy Boys can offer you a test drive on their very own 4×4 off-road test track. Take the Silverado for a spin and check out how smooth and quiet the ride is, even when challenged by the worst of what Colorado’s surface has to offer.